He 177 A-5/R2: Armed with a single MG 81 in the nose, a single MG 151 cannon in the forward end of the Bola ventral gondola, a pair of MG 81 in the rear end of the ventral gondola, a pair of MG 131 in an FDL 131Z remotely controlled forward dorsal turret, a single MG 131 in a manned aft dorsal turret, and a single tail mounted MG 151 cannon. In last few months of the war the He 177 was used on the Eastern Front and for the first time pattern bombing was used. Horst von Riesen, by now Kommodore KG 1, led his Geschwader against the railway centre of Velikye Luki, some 480km west of Moscow. It must have been an impressive sight-a Stab of four aircraft followed by three Gruppen of 27 aircraft in vics at about 6,000m. But the time for Luftwaffe strategic missions was past: most targets were well out of range. Quite apart from any other considerations, fuel was by now so short that such missions were out of the question. Von Riesen was then ordered to send his huge bombers out on anti-tank sorties. After losing several aircraft, with no commensurate return in tanks destroyed, the order was rescinded. Beset by technical difficulties in development, the He 177 had a troubled history in service. Overly demanding design requirements of long range, high speed, heavy bomb load, and dive bombing capability didn’t help. Although the He 177 entered service in 1942 it was far from operational. In an assessment of the aircraft on 9 April 1942, the newly activated Erprobungsstaffel 177 reported that the Greif had good flying characteristics, but had unacceptable engine troubles and problems with its airframe strength. As an emergency measure it was used to supply the encircled 6th Armee at Stalingrad, where it was found to be unsuited for the transport role, carrying a little more cargo than the smaller, more reliable Heinkel He 111, and proving useless for the evacuation of wounded. As a result the He 177s reverted to bombing and flak-suppression missions near Stalingrad. Only 13 missions were flown, and seven He 177s were lost to fire without any action attributable to the enemy. 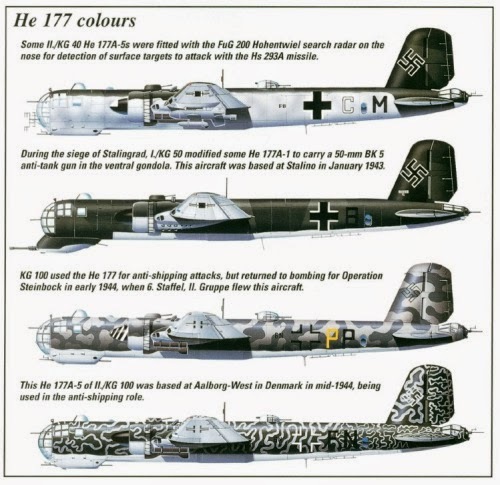 As the war progressed, He 177 operations became increasingly desultory. Fuel and personnel shortages presented difficulties, and He 177s were sitting on airfields all over Europe awaiting new engines or engine related modifications. Of the 14 He 177 sent out during Operation Steinbock, one suffered a burst tire, and eight returned with overheating or burning engines. Of the four that reached London, one was lost to night fighters. These aircraft were brand new, delivered a week before the operation and not fully flown in, because the air unit had moved to a new airfield the day before, and lacked sufficient maintenance personnel and material. Constant attacks against Luftwaffe long-range combat units in France made continuous operations difficult. While Steinbock was unsuccessful, the He 177 did achieve some successes. They typically carried two 1,800 kg (3,970 lb) and two 1,000 kg (2,200 lb) bombs. 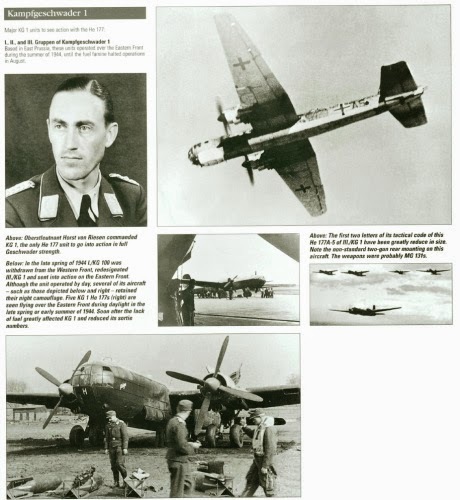 Climbing to 7,000 m (22,965 ft) while still over German territory, the He 177s approached the target in a shallow dive, each aircraft throttled back, the pilot putting his aircraft into a gliding descent to take it across the bomb release-point at about 4,500 m (14,760 ft). After releasing the bombs the pilot re-opened the throttles, but continued the descent at approximately 200 m (656 ft) per minute. The bombers typically re-entered German airspace at an altitude of 750 m (2,460 ft), and headed back to base. By such means, the He 177s were able to keep up speeds of about 600 to 700 km/h (370 to 430 mph) during their withdrawal phase. The higher speed and constant change of altitude made interceptions difficult, increasing the survivability of the aircraft, but decreased accuracy. 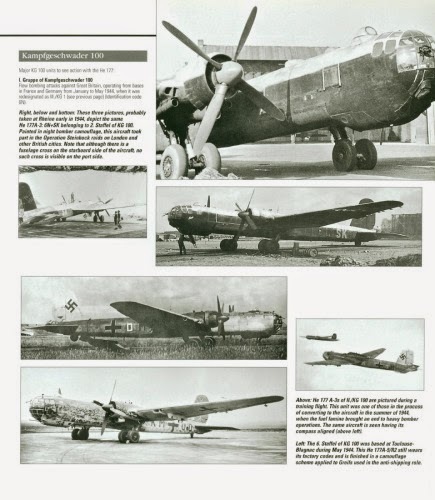 With an average loss rate of 60% for all types of bomber used in Operation Steinbock, the He 177’s loss rate below 10% made them the most survivable bomber in the campaign. During operations on the Eastern Front in early 1944, often carried out in daylight at about 6,000 m (19,690 ft) or higher, losses were relatively light. The Soviet Air Force, equipped mainly for low-level interception and ground-attack roles, was able to do little to hinder the high-flying bombers. In common with most German bombers, the He 177 was grounded from the summer of 1944 as Allied bombing crippled German fuel production. 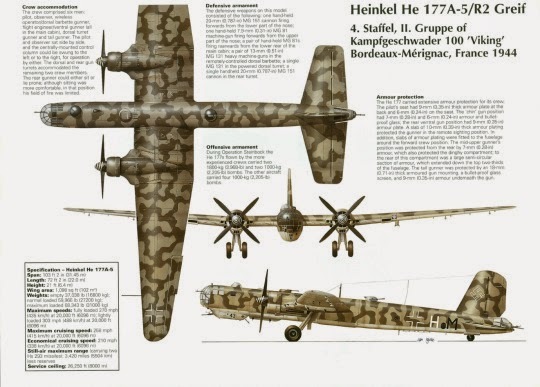 The He 177 can be compared with the Boeing B-29 Superfortress which also took about two years to have its problems ironed out, after which it found success. However the He 177 was never to achieve its full potential. In the Second World War, the greatest deficiency in the Luftwaffe was the lack of a true strategic bomber. The He 177 was the nearest the service ever got to it, although compared to contemporary British and American heavy bombers it was far short of ideal. The 1938 specification stated a warload of 2,000kg over a radius of 1,600km at a speed of 500kph. This aircraft duly emerged as the He 177, which made its first flight on 19 November 1939, piloted by Carl Francke, the man who ‘sank’ the Ark Royal. In an attempt to improve performance by minimising drag, it was powered by two pairs of coupled engines, which gave only half the frontal area of a conventional four-engined bomber, for the same power. In concept this was not too far removed from the ill-fated British Avro Manchester, which used two monster 24-cylinder Rolls Royce Vultures which were effectively two 12-cylinder engines mounted above and below a common crankshaft-and with much the same results: unreliability, overheating, and in-flight fires. But whereas the Manchester was quickly abandoned in favour of the more conventional Lancaster, the Luftwaffe persevered. This was a major error. Losses due to engine fires were unsustainable, and while a handful of He 177s entered service, notably with I/KG 40 from July 1942, delays mounted while solutions to the problems were sought. Eventually they were found, but by then it was far too late. Maximum speed 488kph; cruising speed 415kph; service ceiling 8,000m; range 5,000km plus.